Monster on the Roads of Kolkata! 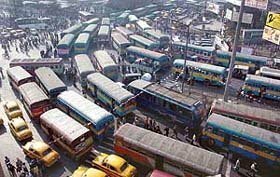 Kolkata definitely has bad traffic, like most Indian cities. I visit the city every few months and realize that it keeps getting worse. I wondered how this can be taken care and came upon an idea – kill the monster taxis! Most other Indian cities extensively use auto-rickshaws as a part of their transport systems. Moreover, autos substitute taxis. West Bengals’s road density stands roughly at 105km of roads per 100 sq. km. and Kolkata’a area of 1036sq. km., Kolkata has about 1100 sq. km of roads. If we start using auto-rickshaws instead of the over 30000 taxis plying on the roads of the city, we can easily free up about 107700 sq. meters of road space! That doesn’t look like a huge number, but it surely can provide some relief. Moreover, consumers too benefit from the move in terms of fares. 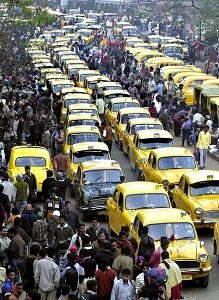 Today, taxi fares are upwards of Rs.10 per km in the city. Compare this with an average Rs.7 that auto-rickshaws in major Indian cities charge for a kilometer of travel. I am sure there are other benefits too – autos definitely cause less pollution, noise and are more efficient than the monster Ambassadors. Is anyone listening?